Ok, near me there are some school zones tat are marked improperly. What they do is they have a traffic control device (sign) that ends the school zone, but then they have an "END SCHOOL ZONE" sign way after, by Texas law, the school zone ends. Traffic law is pretty simple for the most part in Texas concerning signs. The most recent traffic control device, or sign, sets the speed. Example, you are approaching a town and you are on a road marked "SPEED LIMIT 75". That means the speed limit is 75 MPH. When you come upon a "SPEED LIMIT 65" (the most recent sign) that sign designates the speed limit to be 65 MPH. Now the same is true leaving the town. You start out , say at a 30 MPH speed limit. You see a sign that says "SPEED LIMIT 45" (most recent traffic control device) so now the speed limit is 45 MPH, and so on, and so on. 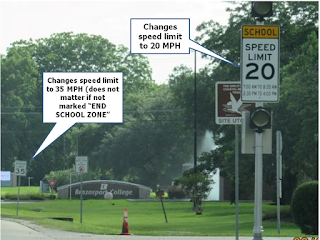 So, here is the problem - the school zone starts with a "SCHOOL ZONE SPEED LIMIT 20" (with some specific times). It means during those times, the speed limit is 20 MPH and you cannot use a wireless device while driving in the school zone. Then you come upon a "SPEED LIMIT 35" sign. 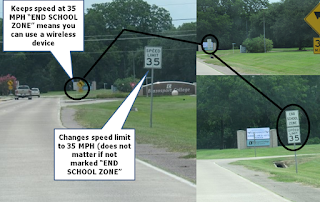 At that point you may or may not be in the School Zone, but the speed limit is now 35 MPH. There is later a sign that says "END SCHOOL ZONE" and "SPEED LIMIT 35." Since there is a sign that says "END SCHOOL ZONE" it designates that the area where you cannot use a wireless device is now over, or ended. 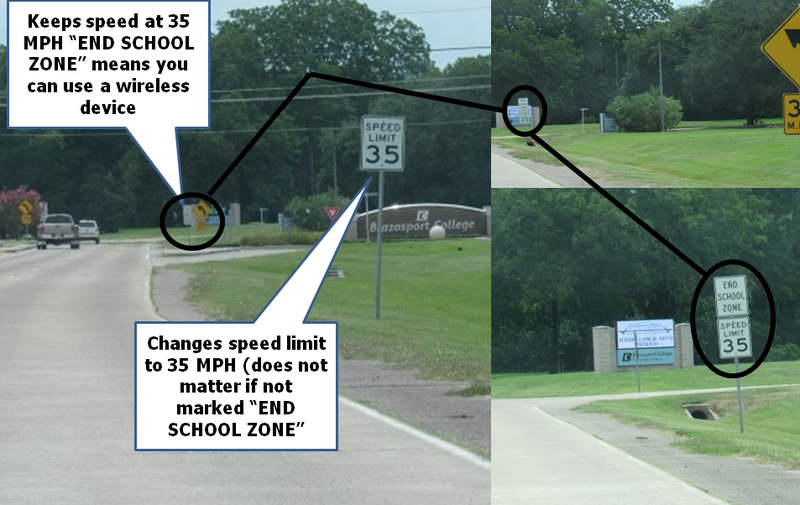 However, intentional or not, the "SPEED LIMIT 35" sign in the middle of the school zone sets the speed limit back to 35 MPH. 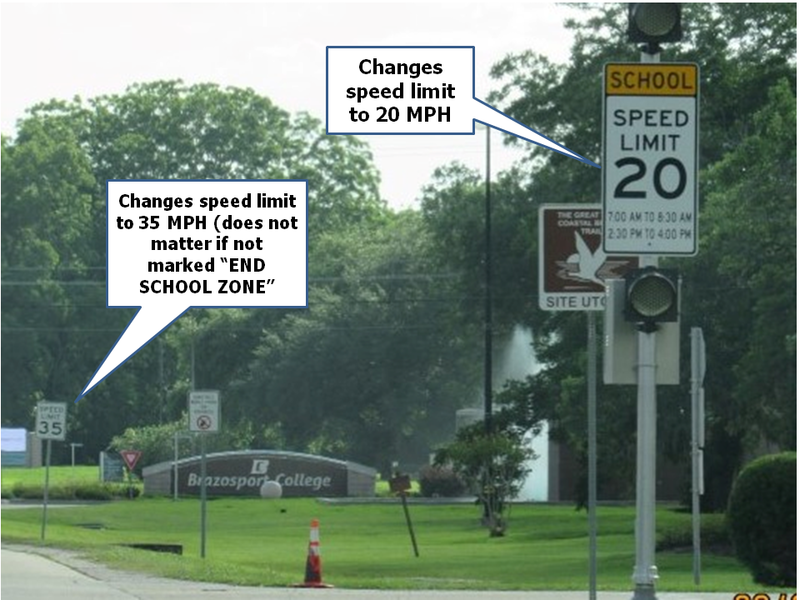 That is the most recent traffic control device and it sets the speed limit, just as the "SCHOOL ZONE SPEED LIMIT 20" had set the speed limit to 20 MPH from the previous speed limit. If it was done intentionally, I smell a speed trap. If not, well, they may need to remove some unnecessary signs. Whatever you do out there - Stay Safe!